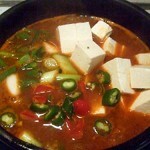 Korean tofu soybean paste soup (두부 된장찌개) is a common soup in Korea. 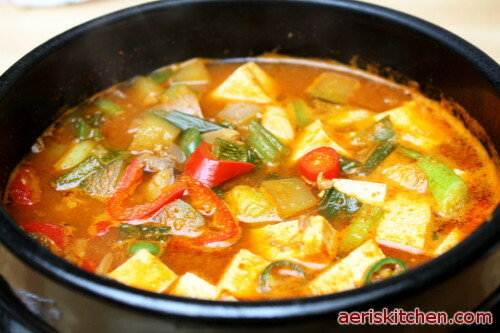 If you cannot eat spicy food, you can skip the red pepper paste, the red pepper powder, and the hot peppers. 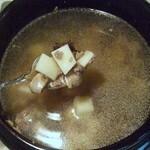 If you are a vegetarian, use 4 shiitake mushrooms instead of 2, and skip the beef. 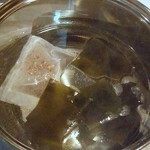 For the broth, add 3 cups of water, 6 pieces kelp, and 1 dried anchovy pack in a pan. 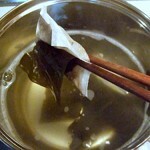 Boil for 5 minutes, and then remove the kelp and anchovies from the broth. 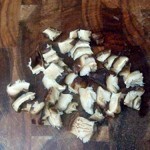 Cut 2 soaked shiitake mushrooms into ¼-inch cubes. 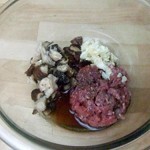 In a bowl, combine ¼ cup of ground beef, 2 shiitake mushrooms, 1½ Tbsp of soup soy sauce, ½ Tbsp of minced garlic, 1 tsp of sugar, 1 tsp of sesame oil, and 1 pinch of black pepper. 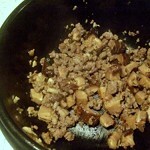 Mix and set it aside to marinate while you are preparing the other ingredients. 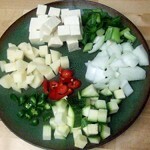 Cut 1 handful of each: potato, zucchini, onion, and tofu, all cut into ½-inch pieces. Slice 1 green onion into 1-inch pieces. Slice green and red hot peppers into ¼-inch pieces. Fry the mushrooms and beef in a pan until the beef is completely cooked. 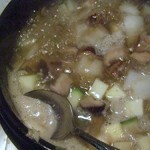 Add the broth and potato. Cook for 5 minutes on high. 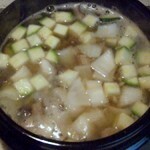 Add the onion and zucchini and cook until the potato is soft. 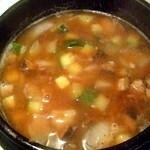 Add 2 Tbsp of soybean paste, 1 Tbsp of red pepper paste, and ½ Tbsp of red pepper powder. Mix to dissolve the paste. Cook 5 more minutes. Add the green onion, tofu, and hot peppers. Cook for 2 more minutes, then turn of the heat. in Poland, but in our home still dominate kimchi and doenjiang because of you and yours recipes. Thanks. Thank you Aeri. I go to your website almost everyday to cook korean food. I live far away from home, and can’t eat my mom’s cooking everyday like before. Your recipes taste just like home! You are the best! Can I just skip the gochujang for making this? I only have the soy bean paste (in brownish container). Hi Ms. Aeri! I was just wondering if it’s okay to use 뚝배기 on a glass stove top? I would like to try this recepie but, I wasnt able to find the dried packet anchvies. I only found fresh anchovies….If its dried does it give it more flavor or it doesnt really matter? This was SO GOOD, Aeri!! Thank you! I just made it right now and ate it. And saved leftovers for another day. I didn’t have ground beef so I just made without. And, I didn’t have anchovy pack so I used something like a powder stock of anchovy. It is spicy, but I served it with a side of rice. Yum. Yum. Yum! !